Miss Maud Naftel was the daughter of Paul Jacob Naftel (who came from Guernsey) and the sister of Isabel Naftel, who were also well known artists. She studied at the Slade School and in Paris, thereafter exhibiting from about 1875 at the Royal Academy, the Old Watercolour Society, the New Watercolor Society and elsewhere in London. She became a member of the Royal Watercolour Society in 1887. 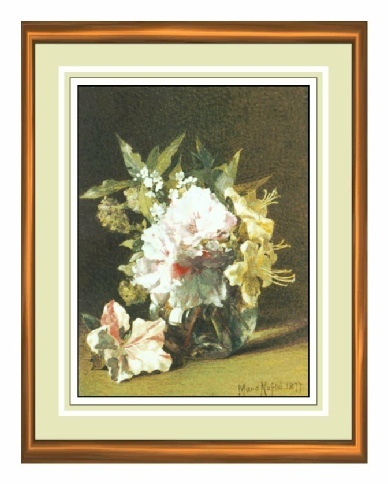 Her painting are normally flower studies, and in fact she published a book on the subject "Flowers and How to Paint Them", published by Cassell in 1891 which includes some illustrations. The above is a typical example of her work.